We are an acclaimed name engaged in providing our precious clients a superior quality range of Estimate Pad. 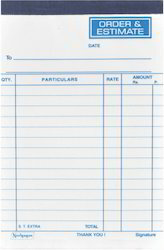 We are presenting excellent quality assortment of Estimate Pad. - Estimate Pad for Rough use. 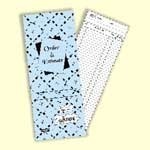 Size 4.25"x7.25" having 50 Multi / Single colour printed Pages inside with cover paper upper side, duly bound by Pin and each page perforated to separate them easily. We are backed by a team of highly skilled professionals and successfully offer Estimate Pad. These are available in various designs. The pads offered by us are manufactured according to Clients Requirement. Apart from this, our offered pads can be availed by our clients at market leading prices.